Lakonia, Laconia, Sparti, Sparta, Gythio, Githio, Mani, Monemvasia, Monembasia, Peloponnese, Guide to Accommodations and Hotels in Greece. Sparta: (11,911 inhab.) is notorious in ancient history for the austerity of its regime, but it is now a provincial town with parks, broad avenues and a pleasant atmosphere. The ride from Argos to Sparta (through Tripoli) is something else. Hairpin turns in the Kleisoura Pass and great views make it worth your while as long as your not driving. The modern town of Sparta (est. 1834) is a little south of the ancient one, of which there is very little left. It sits below Mount Taygetos and is described by Strabo. I didn't make it out to the archaeological museum of Sparta, but they do have a collection there with some pottery, mosaics, and sculpture. The archaeological site (on the bus in, after passing over the Eurotas River, you'll veer to the left and then back to the right, thereby avoiding the edge of the Acropolis), is reached via a beautiful tree-lined road just north of the modern town. The Acropolis of Sparta is not what you might expect, though there the remains of a Roman theater. If you do visit, note the drawings of the ancient stage in the Blue Guide, the scene would be decorated and rolled on metal rods out of a shed adjacent to the theater. Also in Sparta, you can find the Sanctuary of Artemis Orthia and (just south of town) the Menelaion. If you're interested you can find most of the course of the city walls, which were only needed after the ancient city began its decline. Mistras: A few miles to the west is the monastery town of Mistras (now only a few buildings are still used) from the middle ages. Founded in 1249 A.D., the main castle was an attempt to give the Franks a good position with which they could control the local Greeks. They soon were forced to give the site to the Greeks and then the Byzantine State of Mistras thrived until modern Sparta was repopulated in the 19th century. It is quite large and the last emperor of Byzantium was even crowned here. Mistras is worth the visit if you are in the neighborhood. The site was also designated a World Heritage Site by UNESCO in 1989. They also have a small, but cramped, Archaeological Museum of Mistras. The biggest structure, the Palace of Despots (pictured here), was being roofed while I was there and once covered it might make an excellent museum. The mountains around Sparta (really just on the west) are amazing when you are first arriving. The site of Mistras is located near the bottom of their eastern slope. Most spectacular is Mount Taygetos. They also prove no small feat in getting over them. 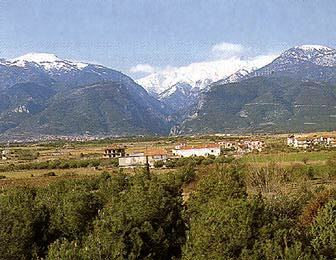 The area from Sparta to Kalamata is one of the most desolate stretches of road in the Peloponnese, reaching some extremely high peaks along the way. The Langadha Pass is no easy feat to cross even on clear days and should be approached with care in inclement weather. Monemvasia: Connected to the mainland Peloponnese by a narrow causeway, the Rock of Monemvasia is home to a beautiful medieval village on the lower slopes and an ancient, ruined, fortress hilltop town. Entrance to the inhabited part of the rock is made through the village gate that leads to a narrow, cobbled thoroughfare that is the main artery of the village. Lined with quaint shops, bars and tavernas, some of which have wonderful sea-facing terraces, the absence of all motorised transport is a blessing with donkeys the only means of transport. A steep track leads to the rock's summit and the ruins of the ancient fortress including the church of Aghia Sophia containing a few but impressive wall paintings. The mainland town of Nea Monemvasia or Gefira as it is sometimes known, has an attractive harbour with plenty of tavernas and cafes. The pebble beach is not remarkable but the town is the perfect base to explore further afield in the southern Peloponnese.